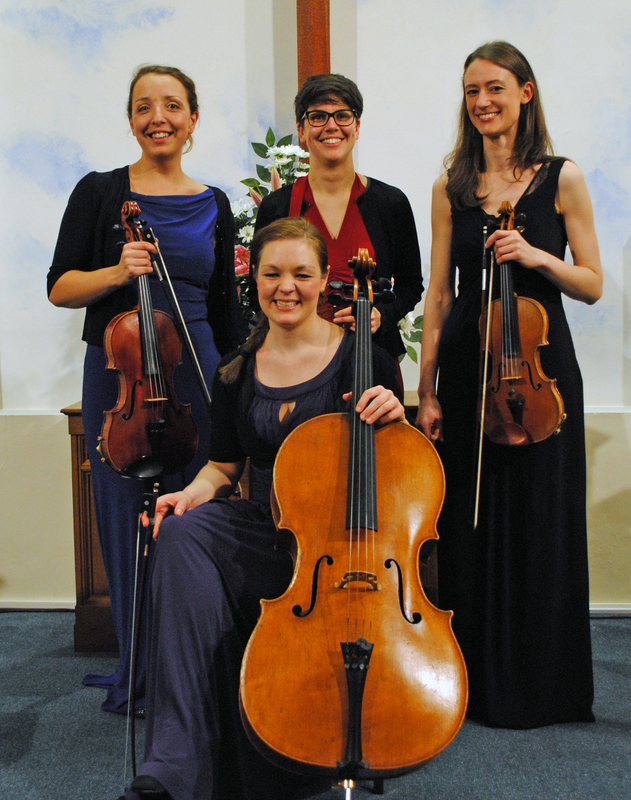 On 28 February, in Farnham Methodist Church, a large audience gathered to hear the Rivoli Quartet play a slightly unusual programme of music. It is not a criticism to say that the concert focused on solemn music with some grotesque aspects. Beethoven’s String Quartet in F Minor Op. 95 was the starter, a piece not typical of the composer in some respects and labelled as serioso. This quartet is stirring and very agitated in parts. It reflects Beethoven’s mental turmoil in 1810 resulting from his disappointment with the evolution of Napoleon’s political objectives. The Rivoli Quartet are young, but also mature in their treatment of challenging music, and their attack in the strong sections of this composition oozed confidence and greatly impressed the audience. In 1924, the Czech composer Erwin Schulhoff wrote the second piece of the programme, The String Quartet No.1. It was probably unknown to most of the audience and they were grateful to be taken through the background to the composition which had been influenced by the composer’s First World War experiences. This was, therefore, another serious piece of music leading to a grotesque finale that describes slow disintegration. Again, this was a piece that was delivered by the musicians with great skill and utter confidence. The second part of the concert took the audience away from contemplation of the outcome of war. Maurice Ravel was an impressionist composer who, sadly, only wrote one string quartet, his String Quartet in F. The listeners were not therefore conjuring up images of horror or desolation, but enjoyed the development of a short musical motif across four movements, treating the theme in variations that disguised it almost completely. The Rivoli Quartet, formed in 1999 in Manchester, are extremely talented and very serious musicians who deliver performances that are highly professional. They started their career as a quartet under the guidance of the famous quartet The Lindsays and they are doing their tutors proud.